The aroma of delicious sweet roast chestnuts roasting on the streets of Andalucía from late October to December, always brings a warm hearty feeling. There’s something really special about eating freshly roasted chestnuts outdoors. There are several areas of Andalucía where chestnuts are cultivated: the Sierra de Aracena in the Huelva province, the Sierra Norte Natural Park in Sevilla province (especially the villages of Constantina and Cazalla), the Alpujarras village of Valor in Granada province, and the Serrania de Ronda in Málaga, in particular the villages of Igualeja, Pujerra, Cartajima and the upper Rio Genal valley in general. Costantina has a very attractive walk aptly name Sendero de los Castañares. All of the villages mentioned are amazing places to visit with your family and camera during the months of October and November to capture nature’s annual spectacle of autumn hues. The foliage is just spectacular and the fallen husks of the chestnuts resemble an army of cute little hedgehogs. 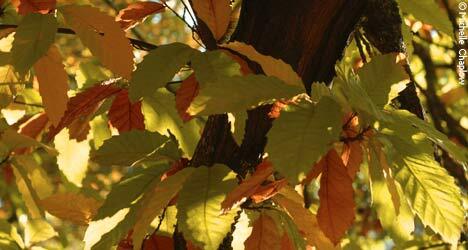 Deep reds, crimson, yellow and orange - no wonder so much poetry has been written about the autumn leaves. 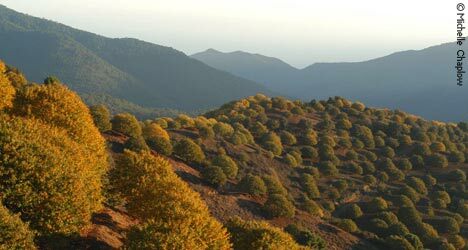 Pujerra seems to be Andalucía’s chestnut capital; this remote village’s economy revolves around the chestnut harvest, and it has its own processing plant and even a festival dedicated to the chestnut. Pujerra’s heritage is indeed the chestnut proudly displaying numerous examples of 100-year-old trees. Local landowner Pepe Gonzalez is the third generation to farm the land of Pujerra and he delights in the whole family getting together for the chestnut harvest. Another family told me that their son returns from university in Málaga during the chestnut season to give a helping hand at the weekends. 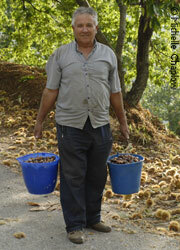 Full bags of chestnuts can weigh between 40 to 60 kilos, so the more hands available the better. 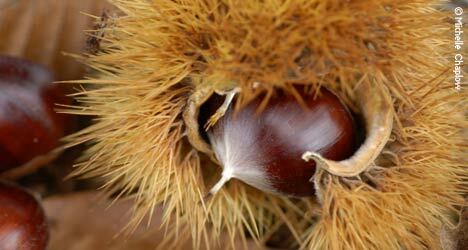 The chestnut trees thrive on the hilly slopes and acidic soils of the Serrania de Ronda; for first grade chestnuts it’s very important to harvest and chill the crop on the same day. Pujerras’s co-operative factory, Castañas Valle del Genal, is a hive of activity at the end of the chestnut harvesting day, with locals all patiently queuing with their day’s harvest crammed into cars, 4x4s, tractors and trailers. The chestnuts are weighed, combed, sorted, graded, packed and chilled for immediate distribution. Look out in the local restaurants such as Casa Benito in Pujerra and El Perol in Igualeja for delicacies such as chestnut cake, chestnut stuffing and purées. Although most of the chestnuts are on private land, visitors to the area happily collect the windfalls on the side of the picturesque roads. Visitors from the coast can be seen with pockets bulging with chestnuts. The nearby village of Cartajima hosts a boutique hotel named Los Castaños www.loscastanos.com overlooking the vast array of chestnut groves. The owner tells us that “there are actually four or five different varieties of chestnuts and the sweetest and most highly prized is the peluda.” Apparently in the village of Cartajima the village grinds to a halt with the postman taking the month of October off and the town hall workers providing only a skeleton service as everyone heads into the valley to join in the harvest. Like everything in Andalucía, it’s a highly sociable event - whole extended families are involved, men women and children. Day trippers Sebastian and Aracile collecting Chestnuts. Heat the oven to 200C or 400F. Spread one kilo of chestnuts evenly on a baking tray. Score each chestnut with small crosses to avoid explosions in the oven. Cook for 40 minutes and serve in paper cones.